Grapes are from the parcels in Puligny Montrachet and near Volnay and Pommard. Age of vine is 55 years old. Frederic Cossard produces wine from only old vines. Fermentation continues 3-6 months with native yeast and aged in barrel(new and old) and foudre(large wooden vat) for 10-11months and in stainless tank for 3 months. Full of fruits - such as mature apple, pineapple, lemon - , rich and fresh. 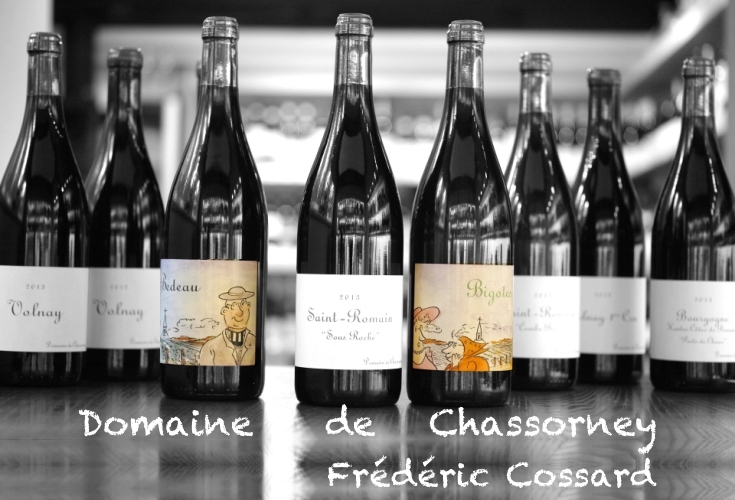 Frederic Cossard established Domaine de Chassorney in 1996 after 10 years experience as a wine merchant, and today he is well recognized as top natural burgundy wine-maker who produces one of most beautiful wine, as same as Prieure Roch and Phillipe Pacalet. Frederic Cossard manages his vineyards by "homeopathic farming". This is one of the most advanced agriculture which is mixture of homeopathy and biodynamie, and it has been developed by Frederic Cossard himself. He does not use SO2, nor any chemical products in the cellar, so vinification is also totally natural. As a result of high level of integration of sense, intelligence and technique, the wines are extremely pure, clean and straightly express the terroir. As same as other natural wines such as Nicolas Joly, Leroy, Priuere Roch, the wine is linked with movement of moon and planets. We can enjoy many different faces of wines at different occasion. We can feel the wines are alive in the bottle and in the glass, it is "Vin Vivant". Domaine de Chassorney : Frederic Cossard owns around 10ha. Saint Romain, Volnay, Savigny les Beaune and Hautes Cotes de Beaune. Frederic Cossard : Frederic Cossard produces wines from buying grapes. He has established strong connection with growers through his previous job and he has the best discerning eyes to choose good grapes. He produces Vosne Romanee, Nuits Saint Georges, Morey Saint Denis, Chambolle Musigny, Chassagne Montrachet, Puligny Montrachet, Meursault, Beaune... all Burgundy appellations. Quality is same as his domaine wines.